Sonakshi Sinha looked gorgeous at a party, but what was wrong with her outfit? Sonakshi Sinha was at the success bash of Varun Dhawan and Alia Bhatt's Badrinath Ki Dulhania. Sonakshi Sinha recently left everyone shocked at the success party of Varun Dhawan and Alia Bhatt's Badrinath Ki Dulhania. 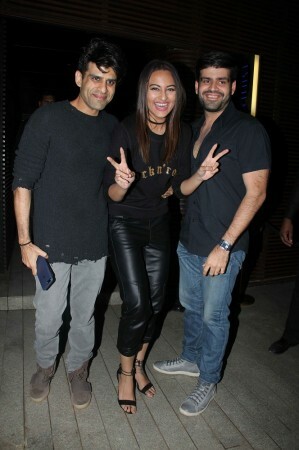 The bash saw the presence of several A-listed celebrities and although Varun and Alia should have grabbed the eyeballs, it was Sonakshi who stole the limelight at the party. Rumour has it that Sonakshi entered the party in a black t-shirt and skinny leather trousers that had the price tag still attached to it, SpotboyE reported. If this was not enough, she apparently announced that she was single after downing a few drinks. The other guests at the party were left surprised with her announcement as there were buzz that she and her beau Bunty Sajdeh were going strong and were supposed to tie the knot as well. On the work front, Sonakshi will be seen next taking the judge's seat in dance reality show Nach Baliye 8. She is also busy promoting her upcoming movie Noor that will hit the theatres on April 21. Noor will see Sonakshi play the central character as journalist and the story will essentially revolve around her misadventures. Check her pictures from the Badrinath Ki Dulhania success bash. (The price tag is, however, not visible in the pictures).